Anderson Locke, a financial advisory consultancy, wanted to attract small and medium-sized business owners to a new service advising on peer-to-peer lending. They had a database of relevant email addresses and wanted an e-shot to generate enquiries. 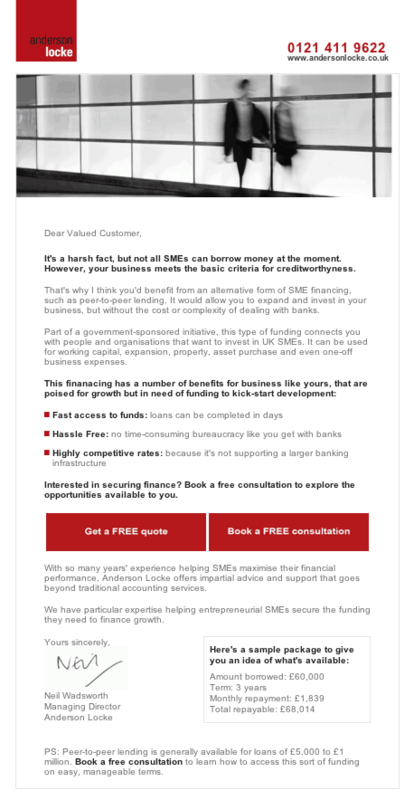 We drafted an e-shot focusing on a key pain point for SMEs - difficulty securing bank financing despite being creditworthy. The copy the emphasised the benefits of peer-to-peer lending, including an indicative package. The e-shot generated enquiries worth £10,000 in revenue for Anderson Locke.